NRMA Motoring & Services will today unveil its first public electric car charging station in Canberra in a bid to support the growing electric vehicle market. The new Electric Vehicle (EV) car charging station will be handed over from Club Assist to the NRMA today and will be a free public service. Local NRMA Director Alan Evans said the increasing take-up of this new technology in Canberra was great news for local owners of electric vehicles. “Canberra has one of the largest concentrations of electric vehicles in Australia, which is why it made sense for us to build our first public car charging station in the ACT,” Mr Evans said. “As the Electric Vehicle market continues to grow and more of these vehicles come on the market, we must have the infrastructure to support them. “In the long term we see the EV revolution as one of the key ways to reduce our dependence on imported fuels and the associated price volatility. 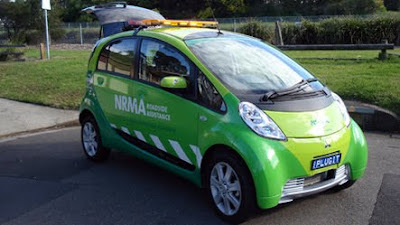 The NRMA’s new Electric Roadside Assistance vehicle (Mitsubishi i-MiEV), will also be on display at today’s launch, to showcase the benefits of clean and green technology. “The vehicle is currently being trialed in Canberra and is one of a number of vehicles can be used with the new charging station,” Mr Evans said. “We see our Roadside Assistance EV as a crucial step towards further reducing the greenhouse gas emissions produced by our Patrol fleet. Currently the majority of our vans run on LPG or diesel. The new electric car charging station will be powered by 100 per cent renewable energy. To date the NRMA has saved over 30 per cent of its carbon emissions by using less fuel and switching to LPG for the NRMA Roadside Assistance fleet. The EV car charging station is located at NRMA MotorServe, 62 Athllon Dr, Tuggeranong, ACT 2900.